It's that time of year again. The 2015 Miss America pageant will air Sunday, September 14 and will once again take place in Atlantic City. The pageant is normally a night of corny, but endearing joy and lots of beautiful, sparkly outfits but last year's event resulted in some "controversy." Miss New York, Nina Davuluri, was crowned as the 2014 Miss America over Miss Kansas Theresa Vail. 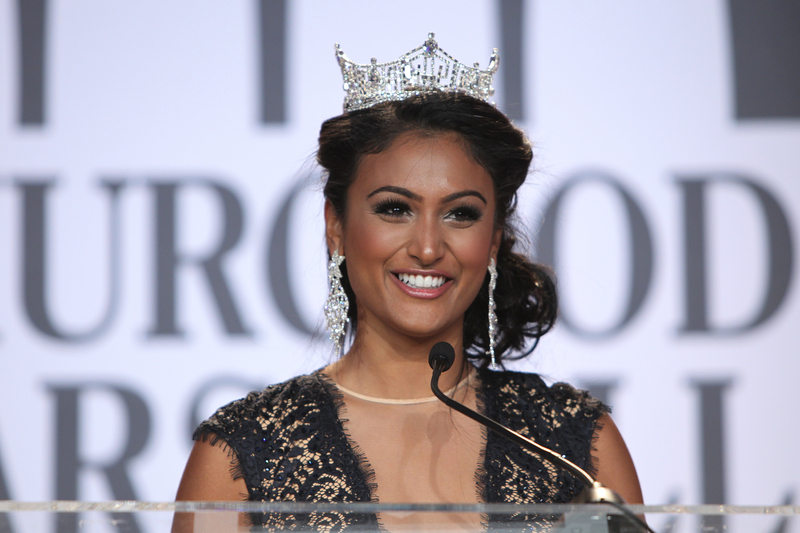 Davuluri's win made her the first Indian American to win the Miss America crown. Sadly the well-deserved moment in the sun was cut short after Davuluri received racist social media backlash from viewers around the country. People took to Twitter and other platforms to make racist and xenophobic comments about the new Miss America. Davuluri was called a terrorist with links to Al-Qaeda, an Arab who wasn't a real American, and troves of other hurtful epithets. Some Twitter users decided to insult Davuluri with extremely stereotypical comments including 7-Eleven jokes. Yes, seriously. Some people were even insulted by Davuluri's win because it was so close to the anniversary of the September 11 attacks. What these people failed to understand was that Davuluri is an Indian American woman who was born in the United States. Davuluri was further insulted by more Twitter users who believed that Miss Kansas, Theresa Vail, was a better choice for Miss America because she was "more American" than Davuluri. Thankfully Vail spoke out against these racist remarks and in favor of Davuluri. "As her friend, as a titleholder, and as a leader, I give her my support. Nina, if you’re reading this, I leave you with a fitting verse; 'Do not rebuke mockers or they will hate you; rebuke the wise and they will love you,'" Vail wrote in her impassioned support for Davuluri. Davuluri herself chose to brush off the comments and spoke to several media outlets about being a proud American and she also showed her sweet, bubbly, dorky, smart personality, proving that this competition truly does reward more than outward beauty. It's truly upsetting that people chose to be so ignorant and insulting in an event that is all about community that chose to award the diversity we have in America. I can only hope this ignorance does not repeat itself if another woman with a diverse background wins the title this year.